Minimotors have been in the electric scooter business for years and have a strong line-up of models. Their Speedway line-up consists of the Mini 4 pro, IV and the III(also known as Swift). Their models are famous for having high speed and distance without compromising quality and safety. Their smallest model, the Mini 4 Pro, have more power and distance than the M365 and ES2 combined. So now you know what we are talking about. These scooters are built mainly for adults and can carry a driver of up to 290 lbs. They are able to fill most needs of adult riders. Minimotors was established in 1999 and have a good track record so we know that these scooters are here to stay. They are constantly evolving and are updating their models on a yearly basis to give you the best experience with as few problems as possible. So now you know they’re way better than the average lightweight options available. But how do they stand up against each other? And which one would best fit into your everyday life? That is what we’re here to untangle. Even though the scooters come from the same manufacturer they aren’t just one design with different sized batteries and motors. Even though they have a similar speed and distance per charge the looks of each scooter is different. Below is our comparison table, you can see the specifics of each scooter. Front Tire(inch) 8" x 2" 10" x 2.5" 10" x 2.5"
Rear Tire(inch) 8" x 2" 10" x 2.5" 10" x 2.5"
There is a big difference in price between the models, especially between the Speedway IV and the Mini 4 pro. The IV is about twice as expensive as the Mini 4 but it does bring a lot of sweet perks with its higher price. In my opinion, most people would do good with the Speedway III and it has the most reasonable price for what you get. It has much better comfort than the Mini 4 pro whilst still giving you a bit more speed and power. And the price jump is barely noticeable. Below is an automatically updated price table so you can see for yourself. To be honest I have never met a manufacturer from Asia that is so eager to take care of their customers as Speedway is. They tweak their models on a yearly basis to make sure they uphold the quality in order to ensure that customers have a problem free ride. When it comes to comparing models you have to keep your needs in mind. Sometimes the cheapest option is the best for you and that’s why we’re starting this off with the Mini 4 pro. The cheapest scooter of among Speedway scooters delivers a really good ride for the money, but I think it comes up a bit short in terms of comfort. It has solid 8” rubber tires both in the front and rear whilst the III and IV have 10” pneumatic tires. The positive side of this is that you cannot get a flat tire. Something that can be very dangerous. But on the other hand, it does lower the comfort of your ride and can increase fatigue during longer rides. The best suspension can be found on the IV and III which both have a more sophisticated dual front and rear spring suspension system. The Mini 4 on the other hand only has a front shock and a less complex rear spring system. On the image above you can see the front shockers and in the image below I perform a jump test to display how the rear suspension works. When it comes to speed and performance the IV delivers almost double the amount of distance per charge compared to both the III and the Mini 4 which both run on an LG 665Wh/52V battery. The III does have the advantage of having a more powerful motor of 600W over the mini 4’s 500W motor. 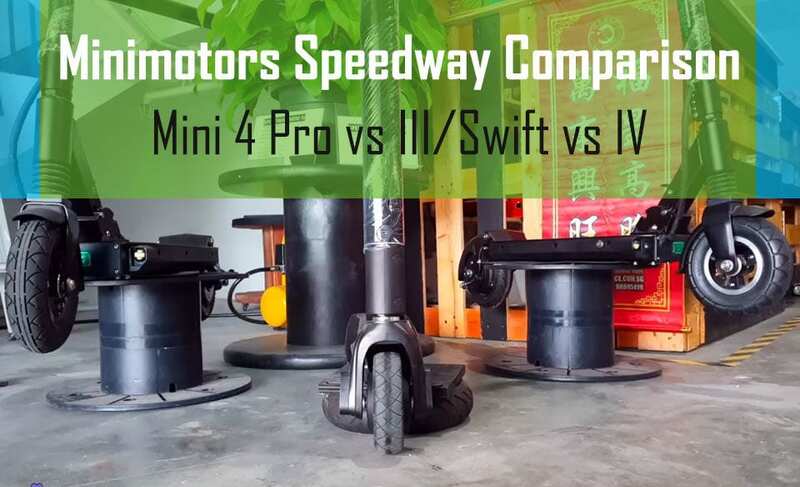 The Speedway IV might have the same nominal watts as the III/Swift, but at peak power, it goes up to 1600W compared to the other scooters 1200W and 1000W. 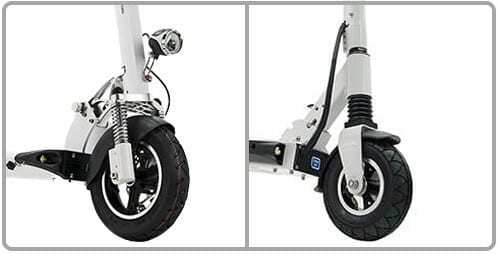 When it comes to size the most compact of the scooters are the Mini 4 both in a folded and unfolded state. The Speedway III/Swift and IV has the exact same size. If you’re looking for a lighter option the Mini 4 is the way to go, but for about $100 extra you can get the Swift which isn’t a lot heavier but boasts a bigger motor and better comfort. The heaviest of the three models would be the IV. Visibility is important both for your safety and others. The best light system comes with IV where you have double deck lights, a headlight, and a tail light. The mini 4 only has the double deck lights and a tail light, and the III comes with a tail light and just the adjustable headlight. However, all scooters perform very well during night time riding, but the IV still has the advantage. Both the III/Swift and IV has a turning signal and horn while the Mini 4 lack these functions. Unique to the Mini 4 though is the small trolley wheels mounted in the front which lets you drag it just like a suitcase when folded. 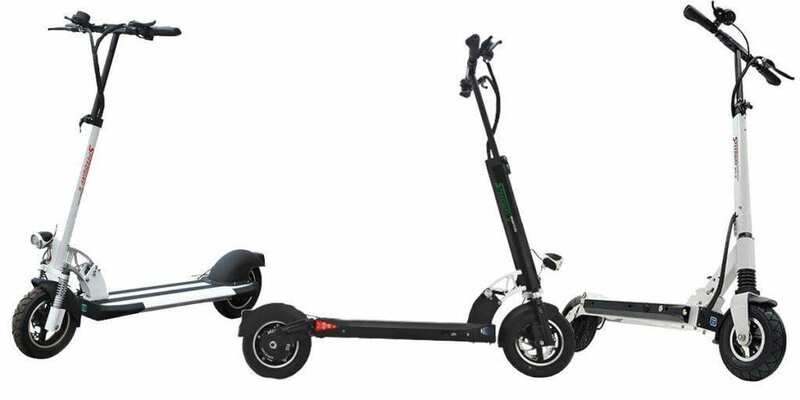 This makes it a very good scooter for commuters and an excellent option for those who need more power than what the Glion Dolly has to offer, another popular scooter that has the same trolley feature. When it comes to performance and quality the Speedway scooters are hard to match. They are a bit more expensive than your lightweight options but they deliver a far superior ride, not only performance wise, but also when it comes to riding comfort. Best of the best is the IV, closely followed by the III, and last but definitely not least the Mini 4. For commuters, I would suggest the mini 4 as it is lighter, smaller and has the trolley feature. All that combined with a really good top speed and distance per charge. The III/Swift is for the price conscious person who wants to get the most bang out of his bucks. He/she doesn’t really need the insane distance of the IV but still want the most comfortable of high-speed rides. The IV is for those of us who value performance and power. The ability to go further than any other scooter before while being safe and fully comfortable. He/she who buys the IV doesn’t have a problem to pay a premium for something that will withstand the test of time. There is a reason why I consider the Speedway IV to be the best model for adults. Do remember that to get the most out of your scooter I highly recommend you to buy the fast charger. This lets you charge your Speedway scooter in no time in comparison to the standard charger. All Speedway scooter models are high-quality products and it basically only comes down to your needs, so make sure you have a good look at the above pros and cons of each model in order to determine which one might be the perfect fit for you.